Editor’s note: After this story published, the Long Beach Police Department emailed an additional response to the Post. We’re providing it in full here. Long Beach is the only city in Los Angeles County whose police department almost never interviews its officers after they’ve shot someone, according to an investigation by the Long Beach Post. Instead of facing questioning by investigators, Long Beach officers write reports that higher-ups in the homicide division review and suggest areas where the officer needs to add details or clarifications, according to people familiar with the process. Police officials acknowledge this method is unorthodox, but say it yields a more complete version of events. However, two sources who have been involved in the process say it’s also used to shield the department from embarrassment and liability when the report inevitably becomes public during a lawsuit. One Long Beach Police Department employee explained why supervisors review reports: “You’ve got to explain this to God and country, and this sounds like an idiot wrote it.” The employee asked not to be identified for fear of retribution. At times, reports have been changed in response to anticipated public blowback, according to a former employee who has participated in these kinds of investigations. “What they’re doing is making the report read better so it fits the shooting policy,” said the former employee, who also asked his identity be kept private to avoid retaliation. The police department denies this. Both sources said they’d never seen any material facts being altered in reports, only the way they were presented. The process can also include scores of small tweaks and grammar corrections, they said. To get a sense of how out-of-the-ordinary Long Beach’s protocol is, the Post contacted or reviewed recent officer-involved shooting documents for the 47 separate law enforcement agencies responsible for policing every city in Los Angeles County. None except the LBPD had officers write reports instead of trying to interview them. The LBPD’s practice is rare and outside the mainstream best practices for law enforcement, according to Matthew Barge, a police-oversight expert who has helped monitor departments under federal consent decrees in cities such as Cleveland and Seattle. “It’s problematic and inefficient and introduces a lot of opportunity for inaccurate or glossed-up accounts of what happened to be developed,” Barge said. Interviews frequently yield more relevant information faster than a written statement, according to Barge. Many police departments are moving toward performing multiple videotaped interviews after a shooting, he said. Additionally, because Long Beach’s policy allows officers to watch body-camera video before writing a report, officers could review footage of a shooting before giving any justification about why they pulled the trigger as long as detectives investigating the shooting give them the OK. These factors raise red flags about how Long Beach investigates these shootings, according to experts. “It can easily be perceived as a cover-up,” said Mohammad Tajsar, an attorney with the ACLU of Southern California who has worked on police shooting lawsuits against the city. Tajsar and the ACLU have recently criticized the LBPD for another long-standing practice. For years, the department used a confidential communications app that automatically deleted messages after a few days, a move that may have repercussions for hundreds of criminal and civil cases, according to the ACLU. Long Beach police say officers are responsible for the content of their reports, not anyone else. “It’s gotta be in his words or her words,” Sgt. Dominick Scaccia said as he explained the practice at a mini–police academy for the public earlier this year. But, he said, if an officer writes that a man got out of a car, raised his hands and then reached down and grabbed a gun, detectives may ask him to add more information. “Just be a little more specific for us. Was he facing you? Where did he reach to grab the gun? What was his other hand doing? Can you describe his clothing?” Scaccia said. A report can go through this revision process multiple times before it’s finalized, according to Deputy City Attorney Howard Russell, who defends the department in police-shooting lawsuits. There’s no record kept of the report’s earlier versions, according to Russell. If an officer starts by writing that he fired because someone was an “immediate threat,” supervisors might suggest the officer explain what the person did that was threatening, according to Russell. He said someone who distrusts police might think this amounts to coaching officers on what to write, but he doesn’t believe that’s what’s happening. “The question you’re asking me is can somebody see the process as coaching? Sure. Can somebody see it as not coaching? Absolutely,” Russell said. Barge called the LBPD’s process “odd,” comparing it to someone critiquing a term paper. “You’d be able to limit that long process to something that is much more immediate with a skilled investigator asking the right type of clarifying question,” he said. There’s no nationwide standard for how officers should be questioned after they shoot someone, but at a minimum, Barge said, he’d expect a police department to have qualified investigators interview the officer to get an outline of what happened and then quickly drill down on details by asking open-ended questions. “If Long Beach wanted to implement certainly best-practice—but I think the really dominant practice for medium- and large-size jurisdictions—they would switch immediately to videotaping interviews,” he said. City officials point out that an interview is not guaranteed to provide better information, depending largely on the performance of the interviewer and interviewee. There is at least one recent instance when Long Beach detectives interviewed an officer after a shooting. In April 2015, Officer Jeffrey Meyer killed a man named Hector Morejon while the officer responded to a trespassing call. Meyer shot Morejon once as the officer peered into an apartment window, illuminating the room with a flashlight attached to his gun, according to a report from the Los Angeles County District Attorney’s office that criticized Meyer for needlessly escalating the situation by looking into the window with his gun at the ready. In his report, Meyer wrote that he pulled the trigger after he saw Morejon turn toward him and crouch down into a “firing stance.” Police never found any weapon near Morejon. Friends, family and supporters protest the deadly police shooting of Hector Morejon in April 2015. Morejon was shot in the back in May 2015, according to a report from medical examiners. File photo. LBPD homicide detectives interviewed Meyer days later, after the coroner’s report revealed Morejon was shot in the back. “Meyer responded by saying that Morejon was facing him when he fired,” the DA’s report said. The DA said it had “serious concern” about Meyer’s tactics but decided not to charge him with a crime, saying legal hurdles meant prosecutors likely couldn’t prove his conduct was criminal. It is extremely rare for an officer to be charged with a crime for shooting someone. 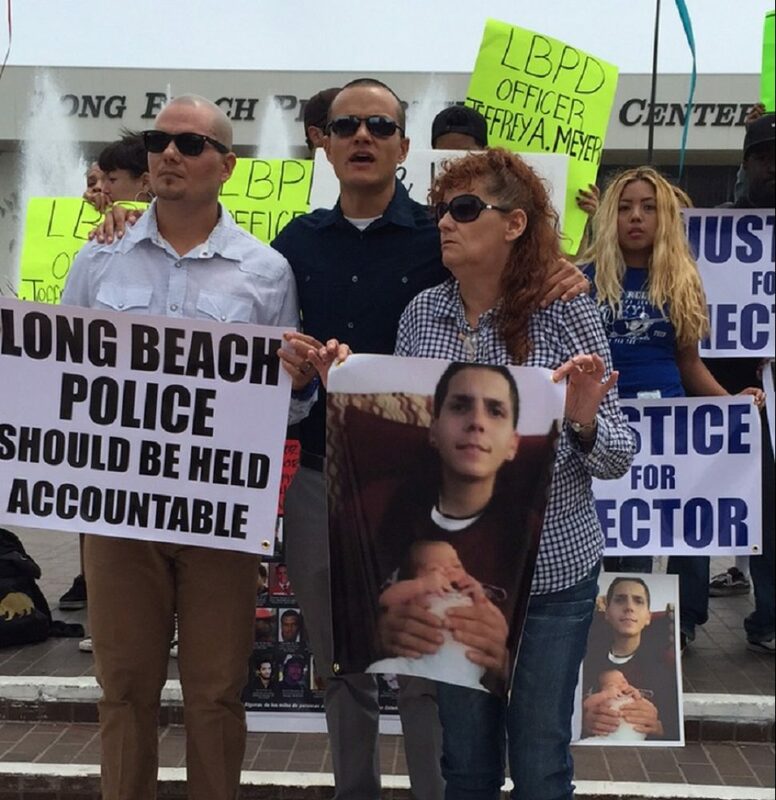 Long Beach later agreed to pay $1.5 million to settle a lawsuit brought by Morejon’s family. Long Beach’s practices run counter to other local departments’ and the District Attorney’s protocols. The DA’s policy says all officers or deputies who witnessed the incident should be interviewed separately and recorded. Police departments that conduct these interviews are then supposed to provide those recordings to DA investigators. In police shootings, the DA decides whether to file criminal charges against an officer. DA investigators are included in the investigative process, but the local police department or the Los Angeles County Sheriff’s Department typically takes the lead in gathering evidence. Despite the fact that it references outside agencies, the DA’s protocols apply only to its own prosecutors and investigators, according to spokeswoman Shiara Davila-Morales. The DA’s office declined to answer further questions and would not say whether any departments other than Long Beach submit reports from officers instead of recorded interviews. Most agencies in Los Angeles County have the Sheriff’s Department handle police-shooting investigations. Sheriff’s detectives typically try to speak with any officers involved. Those interviews are video recorded when feasible and audio recorded at the least, according to Sheriff’s Department spokeswoman Nicole Nishida. The Los Angeles Police Department also attempts to interview officers who have shot someone, but the officers generally refuse to speak with criminal investigators, according to Commander Alan Hamilton, who oversees the department’s use-of-force investigations. Hamilton was surprised to hear that Long Beach police officers typically volunteer detailed written statements about what led up to each shooting and why they fired. “I’m not aware of that ever happening since I’ve been on the LAPD,” he said. Like anyone else, police officers can exercise their right to avoid self-incrimination. Police departments can—and generally do—compel the officers to talk about what happened as a condition of their employment, but those forced statements cannot be used against them in criminal proceedings. They could be used in a civil lawsuit, according to experts, but even then, they’re often shielded from being disclosed to the broader public. Whether officers normally invoke their right against self-incrimination varies by department and depends greatly on each organization’s culture, according to Barge, the police oversight expert. If a Long Beach police officer were to shoot someone in a neighboring city, investigators from that jurisdiction could theoretically attempt to interview the officer. Long Beach, however, goes as far as asking other agencies to alter their procedures and let an LBPD officer file a report instead, according to the department’s manual. Long Beach police officials could not provide examples of any other departments that follow a protocol similar to the LBPD. However, the department’s method has received approval from outside experts and even drawn praise from the DA’s office, according to LBPD Commander Bob Smith. Dale Galipo, an attorney who has repeatedly sued Long Beach, including in multiple police-shooting cases, said he’s long suspected officers don’t write their own reports. “If you read it, it reads like a lawyer wrote it,” he said. He said LBPD’s method is dishonest and contended officers were committing perjury by testifying under oath that these were their own words. “If they had nothing to hide, why wouldn’t the officers give statements?” Galipo said. Long Beach police rejected the idea that anyone in the department was helping craft officers’ accounts. “The officer is responsible for this report. That’s where it ends,” Long Beach police spokeswoman Arantxa Chavarria said. “There is no editing process,” she added.